When Agent Vinod – the home production film of Saif Ali Khan was released showing him as the protagonist, people were looking forward to see whether it is an answer to James Bond movies by Bollywood? Let us try taking a view from our angle. In current times, it is easy to watch the quality international movies almost at the same time when it is released in the overseas market. And as vast variety of Hollywood movies are available to watch on DVD or TV, the viewers became more mature. So the task of the film maker became even tougher to provide better quality movie. On the other side, the budgets of today’s movies are significantly high and the technology is comparatively more affordable and advanced. Sriram Raghavan is of course respected for his work. He was probably the first one to find the acting flair in Saif Ali Khan when he was mostly cast as a chocolate boy. Remember – Ek Hasina Thi – showing Saif as a completely different actor (which was then followed by him in a number of films). Of course Urmila Matondkar’s performance there was also excellent. Agent Vinod is work of Sriram Raghavan, which made the expectations of the viewer even high. The Illuminati production house have spent a remarkable sum of money as the film budget and it is reflected in the film. It must be said that the film is technically nice. The events are weaved nicely and the treatment is good too. The Mujhra song is there which could have been avoided. The “Pungi Bajakar” song is played during the credits. 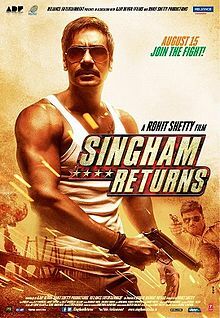 The movie makes you feel that you are watching a James Bond movie in Hindi. Which is its plus and minus point. People immediately start compare it with the James Bond movies which made at larger canvas in all the aspects. And then also the movie stands on its feet of course. Whatever critics say, the movie is a good one to watch of course. You will enjoy the thriller. The casting is first rate and everyone tried acting their part pretty well. It is not an excellent movie nor it is a poor quality movie, go watching the movie with the purpose of getting entertained (solely) and you will be. Let us get a glimpse of the story of the film. In Afghanistan, in Dasht-E-Margoh desert a suspect RAW agent is captured. An an ISI official named Col. Huzefa comes in to get information from him. He was already tortured. He offers a deal to Col. He want some money and safe passage to the Border in exchange of some valuable information. By playing a game Agent Vinod and Major Rajan over-wit and overpowers the guards and officials and comes back with the information they needed to bring in. On the way back they rescue a girl named Farah. The fight scenes are of International quality. The title sequence have the trademark style of Sriram Raghavan. And like, Bond movies, the titles are played with a background song. In Russia, a Mafia don was killed. The rumors are there that during the cold war time Russia was able to create some portable nuclear weapons which can be disguised under some suitcase or similar things. Was the Mafia don killed have had any such thing? If the rumors were to true, it is dangerous. It is even dangerous as when such devices come into the hold of terrorist groups. It can lead to the collateral damage not only to the target country but can also result into a world war! And of course several groups are doing their best to capture this device. In India when Vinod visits his boss in RAW office, he was shown the last message of Major Rajan. Two important things he has to work on then after. Looking for the meaning of “242” and the man who killed Major Rajan has a scorpion tattoo on his forearm. Vinod flies to Moscow and visits a casino owned by Abu Nazer. There he got to know that a person called Freddie Khambhata is to smuggle some valuables to Morocco. He was escaped from Abu’s casino then after. Of course, Vinod finds Freddie and captures him. He then becomes Freddie and meet his mafia boss David Kazaan. Kazaan’s personal doctor was Ruby Mendes. She was actually Iram and was suspect of London bomb blast. Vinod is given truth serum and under the influence of the same have disclosed his true identity and also accepts that he killed Abu Nazer!!! What will happen now? Will he be able to gain control of the situation somehow when he get his consciousness back?! Vinod’s journey from this point onwards is the rest of the film. Saif tries delivering the honest performance and so does Kareena. The main antagonist plays his part well. Ravi Kishen, Shahbaaz Khan and others did the genuine efforts and it is shown on the screen. Agent Vinod – a film of the same name was released a long long ago. It was starring Mahendra Sandhu as the protagonist. This film takes care to remember that one by mentioning name of Mahendra Sandhu in a dialogue. Also Saif could avoid to have beard in the movie. Also the Mujhra song might be avoided. Overall the treatment is good. You will like to watch it once at least.